The statistic illustrates the percentage of each age group who owned a e-reader. 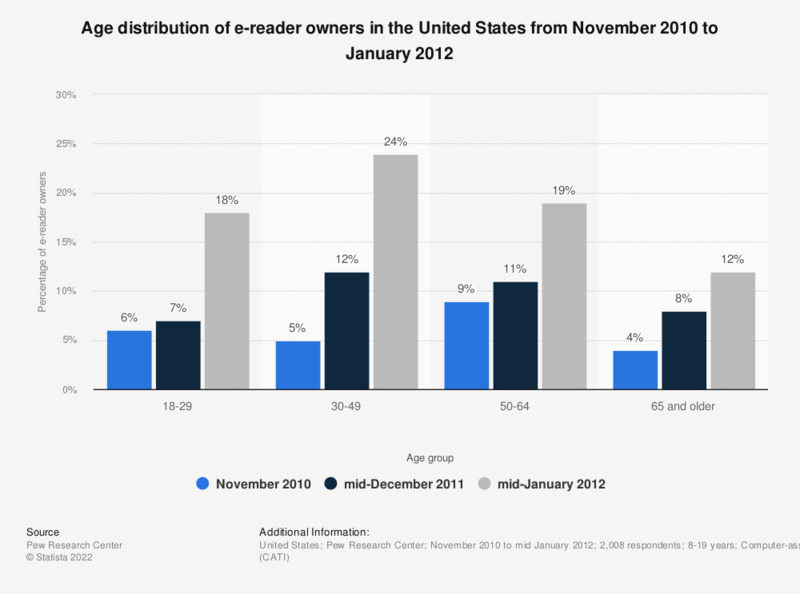 In the United States, E-book reader ownership is most popular with adults under age 50. In mid-January 2012, 18 percent of U.S. adults between 18 and 29 years old owned an e-reader. The December 2011 and January 2012 results shown here are from three new surveys by the Pew Research Center’s Internet & American Life Project. The December 2011 results are from a survey of 2,986 people age 16 and older conducted November 16-December 21, 2011. The survey was conducted in English and Spanish and on landline and call phones.The January 2012 results are from a combination of two surveys, one conducted January 5-8, 2012 of 1,000 adults age 18 and older and the other conducted January 12-15, 2012 among a sample of 1,008 adults.The January surveys were conducted on landline and cell phones. They were conducted only in English.